Heidi teaches at the New England Center for Horsemanship (NECH) and abroad, offering lessons, training, clinics, and workshops. Riding instruction is offered to equestrians of all levels and disciplines, from beginners to seasoned competitors, and horses of all breeds. Heidi has many years of experience working with and riding Gaited horses, specifically Rocky Mountain and Icelandic breeds. Her clientele includes students of Western, English, Trail, Obstacle/Versatility, Dressage (Western & English), as well as pleasure riders. Heidi specializes in the use of Bitless Bridles and offers evaluation sessions to see if going “bitless” might be the answer to your troubles. If your horse tosses his head, chomps on the bit, braces against your hands, gets his tongue over the bit, or offers you resistance in the bridle he may be a candidate. Heidi recommends ruling out pain by having a vet, chiropractor, and equine dentist evaluate your horse as the first step in problem solving. Read Jess’s Bitless Bridle Success Story > and visit our Resources page for Bitless Bridle options. On Farm Lesson: Learn from Heidi’s horses (ground/liberty sessions only) or trailer in your own horses to get specialized assistance. Individual private or group sessions available. Off-Farm Lessons/Workshops: Heidi travels around the New England area offering individual or group sessions. Clinic Add-On Teaching Days: Optional lesson days are often available following Heidi’s clinics to allow for individual or small group extended study or support. Contact Heidi for more information about the above options, scheduling, fees, etc. Heidi offers problem solving and training for horses of all ages, all breeds and at all stages of development. 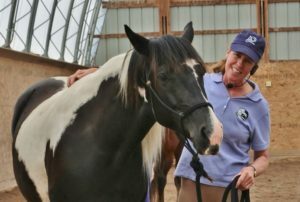 As a Horse Speak™ Senior Instructor and Centered Riding Clinician she can help you reshape undesirable behaviors and improve your communication both on the ground and in the saddle. Her focus is always on creating safer, calmer, more enriching interactions between horses and their humans. 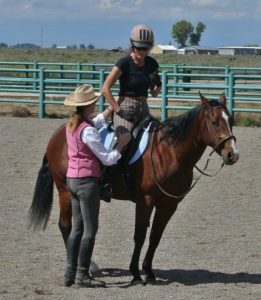 Heidi offers a variety of clinics, workshops and 7-day retreats designed for equestrians of all levels and disciplines. Hosts also have the option of customizing their own event to suit the needs and desires of their staff, students, boarders and horse friends. All events are designed to be fun, safe and educational. Click here for information about Hosting a Clinic or to view a List of Clinic Topics. Lots can be accomplished over the phone or via computer conferencing. Heidi can offer you advice concerning your horses’ behavior, problem solving, evaluation (via videos and discussion) for your horse or one you are considering for purchase. Fees for Phone Consultation are 30-minute session $35; 60-minute session $65. Contact Heidi at heidi@heidipotter.com to make an appointment. Heidi offers prospective owners insights regarding temperament, training, personality and suitability of horses they are considering for purchase. Phone Consultation with videos can be a good first step. In-person evaluations are also available. Contact Heidi for availability and prices. Heidi Potter is available for consultation regarding equine liability cases. She has provided evaluations and/or expert testimony for equine facilities and horse owners since 2009. To inquire please call 802-380-3268 or email heidi@heidipotter.com.